Pasadena, CA’s Gypsyhawk will be celebrating the release of their second album, Reverly & Resilience, with an in-store performance at Vacation Vinyl in Los Angeles, CA. The album release party/performance is FREE and will be held on August 24th at 8:00pm. Additionally, ‘The Great Food Truck Race’-winning Grill ‘Em All truck will be serving their critically-acclaimed, metal-themed burgers before the show from 6:00pm-8:00pm. 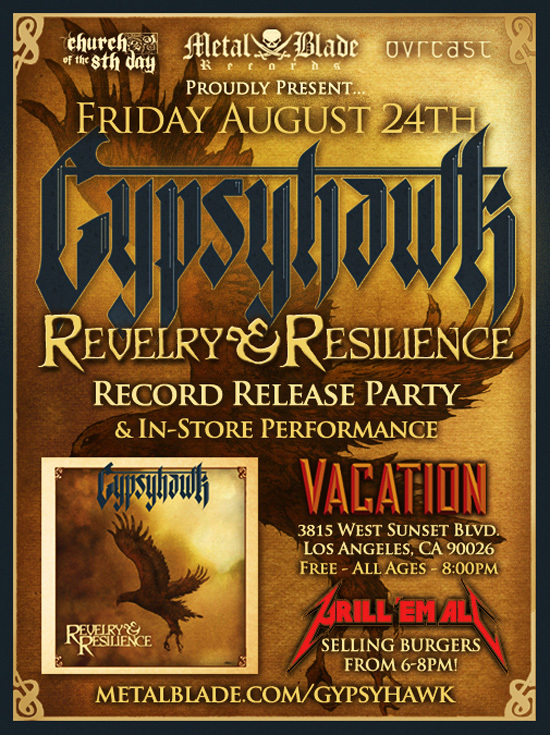 Gypsyhawk and Metal Blade invite all fans from the greater-LA area to help celebrate the release of Revelry & Resilience and crush some burgers! Reverly & Resilience will be in stores on August 28th, 2012. Fans can pre-order the album and listen to the first single, Hedgeking, now at metalblade.com/gypsyhawk. Gypsyhawk will be performing as part of the Mayhem Festival Cruise alongside Lamb of God, Anthrax, Machine Head, Hatebreed, and their label mates Battlecross, plus many more from December 7th-December 10th. For the complete line up, information, and to book a room, visit mayhemcruise.com.